The marinated Shawarma meat is stacked carefully on a long spit and then is placed on the Spinning Grillers Shawarma Grill. The heat from the Spinning Grillers machine will start to sear and crisp the outside of the meat while cooking the inside. The Grill will keep the meat juicy and moist as it cooks on the vertical broiler. Grilling time depends on the amount of meat used. It usually takes between 30 to 60 minutes to cook the meat. What Is Served With Shawarma? 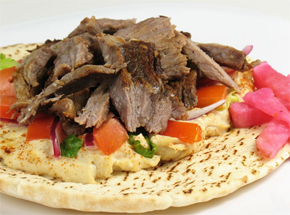 Traditionally, Shawarma is served in a pita pocket with many fixings. Some of these fixings include tomato and cucumber salad, red shredded cabbage, onions, pickles,Tahini and hot sauce. How To Marinate The Meat? Upon buying your meat, ask your butcher to slice it thin or you can choose to slice it yourself. Then marinate the meat as per any of the following recipes. Leave the meat to marinate in the fridge for 45 minutes. For best results, refrigerate overnight. How To Assemble The Tower Of Meat? Begin with the longer piece of meat on the bottom of the tower and start assembling the next pieces in a criss-cross manner. You can layer pieces of meat on top of each other without having to insert them through the spit. Some recipes include a layer of fat in between the stacks of meat. The purpose of adding this layer is to keep the meat moist. Place a tomato or onion on top of the tower and you are ready to grill it. The following recipes call for two pounds of meat or chicken. Feel free to double the amount of meat as desired but remember to double the remaining ingredients. Each recipe will yield 5-6 sandwiches.